Atlas Team Leader selected in Right Brain Brewery’s Homebrew Competition - Atlas Sales, Inc.
As distributors, we spend a lot of time selling, delivering, and displaying beer. We don’t often get to make it. But one of our own, Atlas Sales Team Leader Mike Hall, recently revealed a hidden brewing talent. A beer he brewed was selected last month as a “Brewmasters’ Favorite” home brew in the Right Brain Brewery Distributor-Only Homebrew Competition. 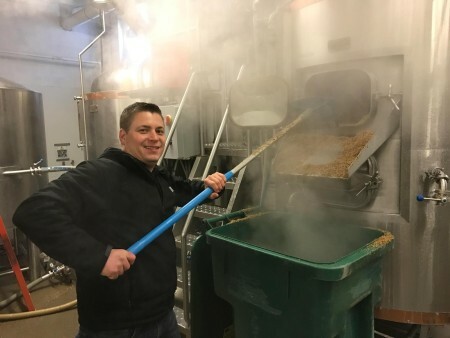 A lot of thought went into the special beer that Mike brewed with his friend Kris Winkle, a teacher at Portage Middle School. “Our beer was a Belgian Amber finished with habaneros. We called it ‘Belgian After Burn,’” Mike said. Mike and Kris admit that they had never made that kind of beer before, but they were pretty happy with how well it turned out. The Right Brain brewers were also impressed. Belgian After Burn didn’t win the highest number of points in the competition (it was a close second), but the brewers liked it enough to invite Mike and Kris to come to the brewery for a collaboration. 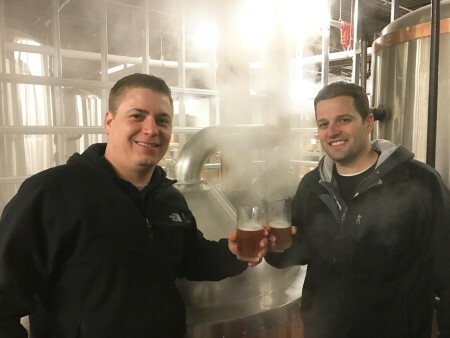 Mike and Kris headed to Traverse City and spent a day brewing a 7-barrel batch of Belgian After Burn with Right Brain’s brewers on the brewery’s production equipment. They had a great time learning how to take their home-brew sized batch and super-sizing it into over 1700 pints of beer. Mike and Kris’s beer will be one of several collaboration beers served at Right Brain’s 2017 Collaboration Day on February 11 at their brewery. The event celebrates the collaborative nature of the brewing industry. For Collaboration Day, Right Brain will tap beers and meads that they created in collaboration with 8+ other breweries, meaderies, distilleries, wineries, and homebrewers like Mike and Kris.